Pending delete domains are those domains in which the owner no longer wants to register or, is out of business or, in most cases, has forgotten about the domain and either believes they can’t pick it back up or don’t want to pay the registrar fees to get it back (about $80-$160). This is a great way to pick up an aged domain that most certainly has backlinks to it as the old owner might have done some work with it in the past. There are a number of places on the Internet where you can lookup expired domains. One of them that we use daily that also offers free membership is ExpiredDomains.net. Once you get logged in you can look through the “pending delete” domains by clicking the Pending Delete tab. You’ll probably notice there are over 500k+ domains on the chopping block for any given day. 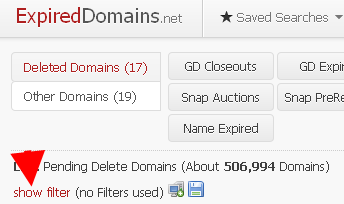 To wade through this huge amount of domains expiring we’ll use filters as shown in the images below. You’ll see in this image the text link for “show filter“. Clicking that link will open tools for finding and sorting through thousands of domains to find the best domain match for you. Once open you’ll notice there is quite a bit you can do with this search tool. What you first want to do is type in the keyword we want to find. In this case our keyword is “bail”. You can also set other criteria such as finding only those domains with a DMOZ listing, new domains, maximum/minimum characters etc. I also suggest you set the number of domains to display at “200” as you’ll notice there may only be 150-400 domains pending delete for our keyword and it’s easier looking at a page or two versus 10 pages. Once you have chosen the criteria for your bail domain search, click the “Apply Filter” button and you’ll then see the list of pending delete domains now only includes domains that have the word “bail” in them. If you want to take it a step further and only pick up certain domains, or those ending with only .com etc, then you will need to click on “show filter” again and then open the “Additional Filter” tab. There you’ll be able to really narrow down what you hope to find. Once you find a domain or domains, then it’s on to step two; discovering what used to be on the domain. For this you’ll need to open another browser window (tab). Go to WayBack Machine and enter in the domain you are considering to purchase. If the domain had anything on it there will be a timeline of cached pages within the history of the domain. Wayback Machine is a great tool to discover the history of a website. What you want to see in Wayback Machine is if there were any pages created for the domain. Example of pages would be index.html (.htm or .php), aboutus, contact, terms, privacy, howbailworks etc. This tells you straight away that these pages are possibly indexed and should be used again when you rebuild saving you time to get the index back on any given search engine. You may also notice that when you build your site, oftentimes you’ll receive 404 errors for pages you didn’t know existed and that search engines are still looking for regardless of your shiny new sitemap.xml file. This happens when the domain used to be owned and managed by another company and may have included pages you didn’t know about. We have a way to find and recover all 404 errors plus in the process, stop hackers cold. Call for more info 347-497-6776. Wayback is also a great method of recovering a domain that may have been lost in a server crash. While it can’t be scraped, we can tediously recover each page and rebuild your site. So now that you have found the domain you want to purchase, it’s now time to wait for the moment it actually gets dropped from a registrars listing. I suggest using NameCheap to purchase a domain, not just that we are affiliates of theirs but that we have saved quite a bit of money and time using their services. You should be logged in to your registrar, in this example NameCheap, and have sufficient funds or your credit card listed in order to buy the domain(s) fast. You shouldn’t have to enter payment information when you are rushing to purchase the domain as there may be other people attempting to pick up the domain at the same time you are. With NameCheap you can fund your account using Paypal, Bitcoin or any credit card. So consider putting $20 – $100 on your account depending on the number of domains you may be purchasing. While in NameCheap (or other registrar) continually check to see if the domain is available for purchase. NameCheap makes this simple by having the register button directly on the left side of the page. You can also set the controls to do a bulk search for up to 50 domains at one time. But, click the DOMAINS button and a screen will appear prompting you for the name of the domain. Enter the domain name and hit SEARCH. Do this until you are able to buy. The NameCheap system will then show what domain is available. If your domain is greyed out then it has not yet been released. This is the waiting game portion of the registration system. Most .com domains are released at anytime between 11AM EST and 4PM EST. I have even witnessed some drop at 6PM. Again, it depends on the registrar. I believe GoDaddy may drop a domain only if they have not had a buyer in their own system. If you are a GoDaddy customer it’s best to read their rules for dropped domains. The domain extension “.info” I have witnessed may drop at midnight up till 3am. Same with .mobi extensions. But, just be patient and keep the screen open and continually have the registrar search. When it is available it will be highlighted and allow the purchase to proceed. Now then, there are services which offer to grab the domain for you. Prices start at $49 up to a few hundred. The problem with some of these backorder places is they may hold the domain and then place it for auction on their site. You have basically paid them to secure a domain for the highest bidder. Simply placing a backorder on a domain does not secure the domain for you and could set you back a few bucks. Always read the fine print with these places that claim to backorder domains for you. Also be weary of emails you might receive about a domain which resembles yours. Often you’ll get an email from some unknown outfit which will claim to be able to get you a domain which is dropping. It’s in our opinion to send those emails to the zero file (delete). It’s nice they send you a heads up about a domain, but way too dicey in our opinion to be sending cold hard cash to “wherever”. So there you have it; the best way to find a great pending delete bail bonds domains. If we can be of any assistance please call or email we’ll be glad to chat with you about buying premier bail domains. You can be the new owner of a premier bail bond domain in less than five minutes. Pay with either Credit Card, Debit Card, eCheck, or PayPal. Did you still have questions about purchasing a domain for your bail company? If you have any additional questions or concerns about buying a domain name that are not answered above, call us at 347.497.6776 and we’ll be glad to chat with you about your domain name goals.